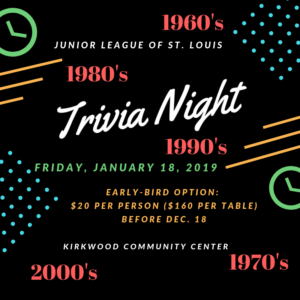 Annual trivia night supporting the Junior League of St. Louis’ training and community programs. This year we will have a decades theme. Five of the rounds of trivia will be from the 1960s, 1970s, 1980s, 1990s and 2000s. Attendees are encouraged to decorate tables and dress up. This fun evening will be held at the Kirkwood Community Center, 111 S Geyer Rd, 63122. Doors open at 6 p.m., with trivia competition starting at 7 p.m.
All tickets include beer and refreshments. There will be raffle prizes, a 50/50 drawing as well as a silent auction! Please feel free to bring your own food and drinks. Trivia teams will be tables of 8. Open to the public, the event supports JLSL’s mission, including offering our members volunteer and leadership training opportunities.